Water extraction is something that you hope will never be needed but, unfortunately, life isn’t always perfect and it is required for drying after flooding or water damage. When a home is subjected to standing water, the damage can go further than structural so expert knowledge and skills are required to complete the job effectively and efficiently. While most restoration companies that provide ‘restoration’ services only remove the water, dry, and then clean, there are just a handful that can provide a complete service to ensure that the water has gone and mold/bacteria problems will not occur. 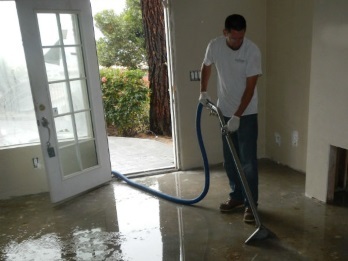 In order to protect your family and house, you should be contacting Gold Coast Flood & Mold Specialists as they have the skill and the experience required for water removal and everything related. Once water has been removed, the job isn’t over because it can lead to problems with the structure of your home and even insects, bacteria, and mold. Therefore, care needs to be taken in finding the source of the problem so it can be repaired; after doing this, the issue can’t then occur in the future. If a storm is to blame, missing exterior may lead to a case where the water cannot be stopped but you should do all you can to prevent the water levels rising within your home. Category 1 – When a pipe bursts or there is a crack in the plumbing, this will generally be considered category one because it is mostly clean water. For example, it could also be the delivery pipes to the sink or a broken washer supply line. Category 2 – A little more serious, this is gray water where chemicals or other contaminants may be held within. Due to the chemicals, it could cause sickness and discomfort. For the most part, this will be from overflows in the toilet, appliance system leaks, or even a broken fish tank. Category 3 – Finally, we have black water which is likely to be from backflow in the sewers that come from deep within the system. With unsanitary agents within, it can also stem from rising levels in the local streams and rivers. What Should I Do? – As a homeowner, you should contact Gold Coast Flood Restorations as soon as possible and the professionals will be with you in good time to begin water extraction. With a heavy emphasis on training, this is then coupled with experience and we can provide a fast and efficient service to all. Not only will we attempt to resolve the issue, we will ensure that all water is removed from inside your home. If you call a second-rate service, your home will be susceptible to mold and mold remediation will cost you a lot more money than if you were to phone us in the first place. As well as removing water, we will assess damaged carpets, drywall, and baseboard to ensure that your house is in a position to move forward safely. Regardless of whether it is commercial or residential, contact us today and we will help you get back onto your feet!